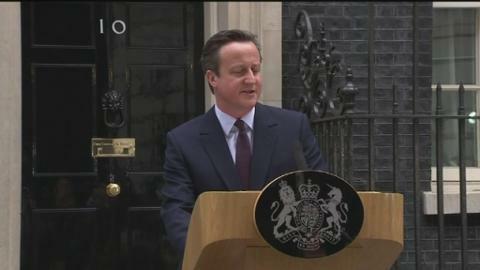 Prime Minister David Cameron has paid tribute to the leaders of the Liberal Democrat and Labour parties. Opening his speech outside Downing Street, having been to see the Queen to request permission to start a government, Mr Cameron paid tribute to his former coalition partner Nick Clegg and Labour opponent Ed Miliband. I have been proud to lead the first coalition government in 70 years and I want to thank all those who worked so hard to make it a success. And in particular, on this day, Nick Clegg. Ed Miliband rang me this morning to wish me luck with the new government, it was a typically generous gesture, from someone who is clearly in public service for all the right reasons.